I thought it would be fun to share a few of my tips on how to pick the right race to run. While, there is absolutely nothing wrong with just picking one at random. Depending on what type of runner you are. There are definitely a few things you may want to consider first. So you don't accidentally find yourself part of the 20% who for some reason or another don't show up to the race, or are unable to finish. If you are a faster runner, you may not have to worry about this. But those who may have a slower pace, or plan to walk most or all of a race. Should check the race website and look at required finisher time. If you know you can come in under this time then go ahead and register. But if you are worried you may not, or aren't quite sure. It would be better to pick a different race with less strict finish time. The reason for this, race director choose time requirements based on what the cities/counties permitting can allow. If you can't finish under those time, not only can it be risky when the race support is pulled, but you risk getting picked up with the swag bus, unable to finish. But don't worry, there are several races around the country who are quite generous with their finisher time requirements. Make sure the distance is something you can train adequetly and properly for. So often runners will select race and realize later that its coming up too soon and they aren't going to be able to train for it in time. Or they will select a distance that is much greater than anything they have done before, not realizing the time commitments it may take to train for it. Running a race you are not trained properly for, can cause injury or even in rare cases believe it or not death. So when you select a race, think about it before you enter and make sure it is something you have ample time to train correctly for. For many runners just finishing a race is reward enough. But if you are a runner who likes a medal to add to the accomplishment. Double check what the finishers will receive ahead of time. If you want a race shirt, check to see if it is a participant shirt or finisher shirt. So you will know ahead of time if the money you are putting towards the race is going to be getting you what you want. Although you may not have to worry about this for shorter distances. 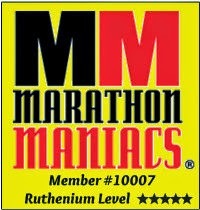 For longer distances, Marathon/Ultra's etc. its definitely something to look into. Most street races have course support and plenty of water stops. If you are running a trail race, or ultra's, some relay races and even occasionally some of the smaller races you may have to supply your own course support at times. Double check these things ahead of time, so you know if they have what you are looking for, or if you need to prepare in advance to bring your own. For a shorter race like a 5k or 10k it likely won't matter as much. But if you are planning on running a distance race and you enjoy drinking sports drinks. Check the race website ahead of time and see what they will be serving. If it's not something you're used to. It's definitely something to consider as you train, so you can begin using them in your training runs. Why is this important? Well in the chance the new drink doesn't mix with your stomach well, you will have less risk of spending more time in a port-o-pottie than running in the race. #6 Look at the start of the race, and consider transportation. Some races may have you meet somewhere and then bus you to the start. Others allow you to park at the start or finish. If you are alone, or planning to take yourself looking at this information before you register is a plus. Especially if you want to pick a hotel that you can walk to the start or finish. Or so you can plan for a ride after a race to take you back to your car. While most runners including myself would tell you to train for any condition when you are race training. Not everyone understands what a difference heat, humidity, cold can do to you if you are not accustom to running in it. While you don't need to be discouraged entering a race that is different than you are used to. Knowing a head of time what to plan for temperature/weather wise will help you better prepare, especially for destination races. 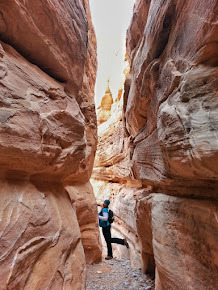 If you are a runner who trains mostly at lower elevations on flat surfaces. Before you enter a race in a new area it is a good idea to check the course map and elevation charts. Not to discourage you, but so you can better prepare and know in advance if you need to take a few weekend trips to get some additional hill work in. Some races have race day packet pick up, others do not. 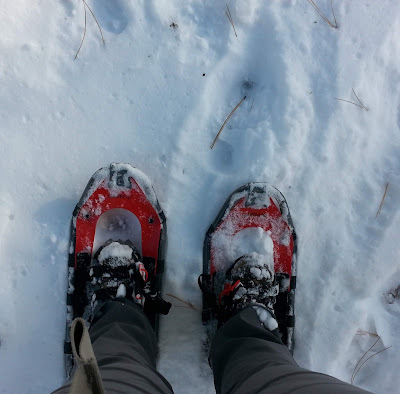 If you are traveling in, it is a great idea to check in advance and make sure you can plan you trip to arrive in time to pick up your bib info especially if you must be there the day before. If you know you won't be there at the expo times, knowing in advance what you can to do either have someone else pick up your bib for you, or even if possible you can have it mailed to you so you won't have to worry about it come race day. A lot of races are starting to ban things like headphones for runners own safety. Other races have very strict no littering policy's along the courses. Some races ban certain items just for the safety of others, and may not allow backpacks, larger water containers, selfie sticks, glass items props, strollers, bikes, pets. Because of the safety of other's you'd be surprised at a lot of the banned items in races, especially the larger ones. Additionally, some races let you know ahead of time if you veer off the course, or decide to run on the wrong side of the road, you will be immediately pulled from the course. They do these things for a reason, it's best to respect the requirements and go with the rules for yours and others safety! Races can be a lot of fun. But the fact is, not every race is right for every runner. If you want to have the best experience possible, check into these and any other thing that is important to you before you pay the registration for a race and discover later that it wasn't what you thought it was going to be. What is one thing you check on when you go to register for a race? These are all such great tips, and when I started running last year I had no clue about any of them! More than once I panicked last minute about realizing there was a cutoff time. I can't tell you how much it aggravates me to participate in a race that is close enough to drive to on race day, and they don't have race day packet pickup. Argh! Good point about checking what they will have at fluid stops. I ran the Women's Half in Nashville and they served this horrible drink, now I don't remember what is was. I thought maybe they didn't mix it correctly at the first stop -- NO. I had to spit it out and was forced to drink only water. It was very hot that day and I needed electrolytes. Great tips! I always start with looking at cut off time and the course. Then if those two things look good to me, I start looking at the rest of the logistics. And cost, definitely cost. I'll pay for one or two big races in a year but then look at affordability for the rest of my races. You have given some great tips in this post,. I once forgot to check the course elevation map and it was a huge whoops on race day. It went fine, but those hills in Asheville, NC were brutal! I did not realize there were races with a no littering policy. I guess I would just carry all the gel wrappers to the finish line. Location and logistics are very important to me. I ended up paying for a hotel in London through a tour group so that I could be on a bus to the start line with runners. However, the price for the hotel was good compared to other London hotels. I'm all about looking at the course... & where the race is. I hate a race that has horrible location for parking & hard to get in & out of. We had a race that changed its course one year - I saw where it was & didn't go. I heard later that traffic was so backed up, more then half of the people didn't make it to the starting line in time. It was a nightmare. I love these tips!! I think distance, time requirements, weather, and elevation are definitely the ones that I think through most when I'm considering whether or not to run (though I admit, it's been too long since my last race!) These are fantastic reminders!! Glad you enjoyed the tips! Thanks for stopping by! I know some races just can't find enough volunteers to do packet pick up and race day stuff, I would imagine that is usually the case. But I have also heard some races require no day of packet pick up for insurance reasons so they know in advance who is and isn't out on the course. It's tough though, I totally know what you mean! Most here don't have packet pick up day of for those reasons, that is how I knew about them. I made the mistake in Alaska taking a drink around mile 19 (thank goodnes I didn't do it earlier) of their sports drinks, I forgot to grab a water to chase it with and I had this horrible taste in my mouth and stomach for a few more miles until I could get some water to dilute it with. I do check the cut off times too, usually they are okay, but once I did have one email everyone that they had to shorten the cut off time from 6 to 5 hours for a marathon because of permitting. I knew it was going to be close but I was glad they notified us a month in advance so we could prepare. Most rarely change the like that after you sign up. I never realized until I started running how elevation and hills are a good thing for some runners to check. Out west most of us live in higher elevations and hills are just a way of life. But I ran into so many runners from back east who don't have those luxuries, and they seriously struggled because they didn't know to prepare in advance for those things. I've seen the no littering policy at several races for years. Usually you are okay to drop off gel packets within 50 feet of a water station. But no where else on the course. I totally get it, especially when your running through the country or in mountains no one wants that liter to blow all over and not get picked up. I've done that many times with hotels to, depending on where I was running. Your lucky you found a good price though. In my experience the hotels around the start have always been ones asking for double or triple what other hotels do. So you found an awesome deal it sounds!! Oh wow, yeah that sounds like bad planning on the race directors part, yikes! Glad you liked the tips Rachel! I look at distance, location, and cost. Everything else? Meh. I just love to run in new races. Great tips and lots to think about! 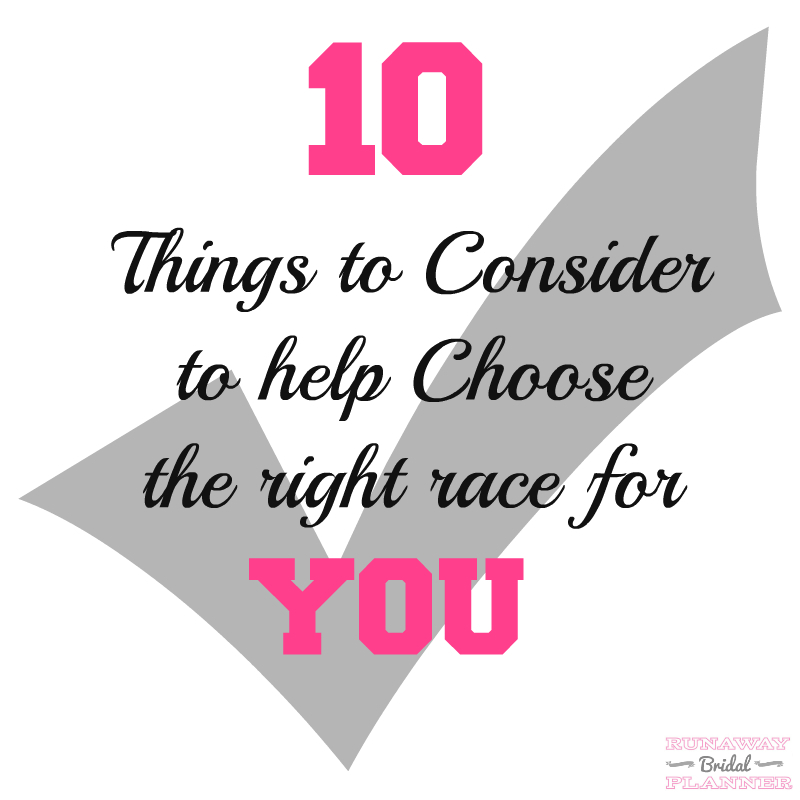 I look at many of these factors when I consider what races to register for. Registration cost and travel costs are two key factors, because if its too much of a stretch to be able to get to the start line then I shouldn't even be considering the other factors. Aren't they all the right race? I used to run every race I could fit into my schedule. This year I am being much more selective. However, these are really great tips. I still check the finisher time requirements even though I know I will finish with time. great tips! i would have never thought to check #5 so thanks! I agree selfie sticks should be banned on race courses. But great idea to check what else is banned. I remember a race I did where there wasn't anywhere to store my stuff so I was glad I didn't bring valuables with me. I didn't lose anything but I only had throwaways so it didn't matter. The last thing you want to worry about when you're racing is whether your valuables are safe. All are great things to consider when choosing a race!! I look a lot at cost and distance from home. Love this post! I take #7 and #8 seriously because Anchorage has a mild, non-humid climate at sea level and when I run in super hot, humid, high elevation places I do not do too well. Great tips! I sure could have used Manny of these for my 1st race. Lessons learnrd!! I'm very impulsive when I sign up for races. Luckily most of the races in this area don't have elevation issues as Florida is pretty flat. I have run into issues where there wasn't enough water on course- they had one water stop but it was the middle of June! I was so thirsty when I finished. These are definitely great things to think about when signing up for a race, and I'll be taking all of this into consideration when planning for my first marathon next year!